Multi-disciplinary team of highly educated solution experts recognized as the best in our disciplines. Many former Oracle employees. 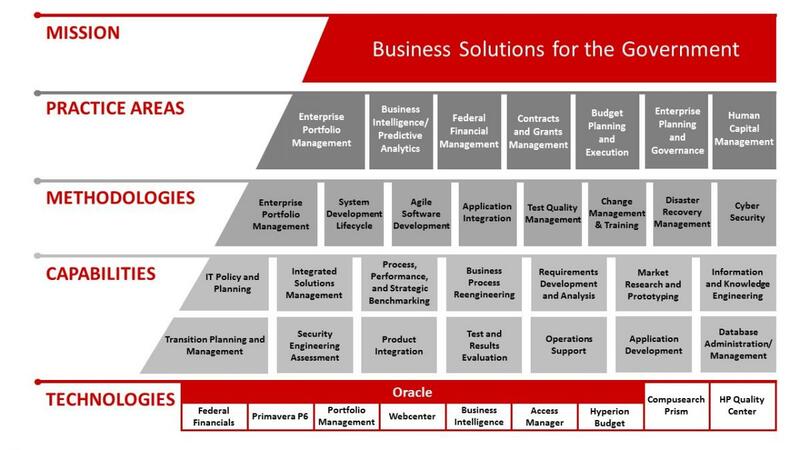 As shown in the Figure above, Appsential is focused on four practice areas; Portfolio Management, Business Intelligence and Predictive Analytics, Federal Financial Management and Contract and Grants Management. We have developed industry leading methodologies and capabilities as a systems integrator for COTS solutions including Oracle and Compusearch. With our mission of providing Process Driven Repeatable Solutions, Appsential applies our federal government domain knowledge to support innovative approaches in scenario planning and analysis, and migration to data driven, transparent decision making and integration of systems across the enterprise. Download our Statement of Capabilities to learn about our People, Our Performance and Our Results.